Recruitive are proud to announce the launch of the new Jobs Board for Ex-MilitaryCareers.com. Recruitive have furnished them with a new jobsboard of the highest specification to deliver the best possible service to their clients and candidates and enables accurate searching and uploading CV’s quick and easy. It has been upgraded to a secure, GDPR compliant and responsive jobs board and careers website. Ex-MilitaryCareers.com new Jobs Board is of the highest specification to deliver the best possible service to their clients and candidates and enables accurate searching and uploading CV’s quick and easy. 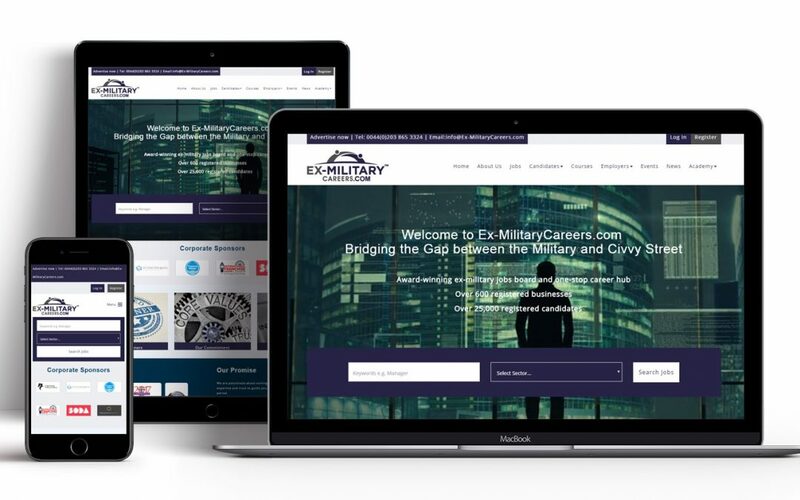 Their job search engine has now been upgraded using industry leading technology to guarantee that Ex-MilitaryCareers.com is the most effective and cutting-edge online recruitment solution for our members. Launched in 2010 initially on social media, because they wanted to help the process of transition and resettlement for ex-military personnel as they realised that the process was often far from smooth and straightforward, Ex-MilitaryCareers.com has grown to be an award-winning ex-military jobs board and one-stop career hub with over 600 registered businesses and 25,000 registered candidates. Their website also provides information on relevant courses through their affiliates and other advice and information relevant to the cause. We were also responsible for generating the news, website content, articles and social media content. They operate as a social enterprise, and provide a foundation mentorship platform. Still in its early stage of development, here to support ex-service men and women with mentoring, education and career expenses beginning their journey to establish a civilian career. Working with organisations committed to employing ex-military men and women and who see them as highly valuable assets to their business. E-MC provides excellent opportunities, from boutique agencies to FTSE 250 companies, below are some of their key industry sectors. Since inception, Ex-MilitaryCareers.com have assisted businesses to hire top ex-military talent and have also assisted in consultancy, sustainability & social enterprise, mentorship, recruitment & CSR based projects. Ex-MilitaryCareers.com are proud of our Social Enterprise status which reflects their integrity of purpose and demonstrates their commitment to ex-military men and women. For businesses engaging with Ex-MilitaryCareers.com, they have the best pool of relevant talent for their business requirements. They also offer a strong social media platform and are proud of the breadth and vitality of their social media presence and highly engaged audience of men and women. Ex-MilitaryCareers.com are here for our ex- military men and women every step of the way. This is the ethos of what they do. Contact them today!